Many are familiar with Michael’s on East, the delectable dining restaurant located in Sarasota. Equally as impressive though, is the restaurants urban-inspired Michael’s Wine Cellar. Hosting more than 1,000 International estate-bottled wines, the cellar is a premier spot offering premium & boutique spirits, imported & craft beers and more than 200 boutique wines under $20. More than just a wine store, the space is also easily transformed into the perfect place for any type of special event; including luncheons, rehearsal dinners and receptions. For a site providing so much versatility, we wanted to ensure clearly labeled functions and frills. To start, this included a simplified header separating each offering into its own compartment. 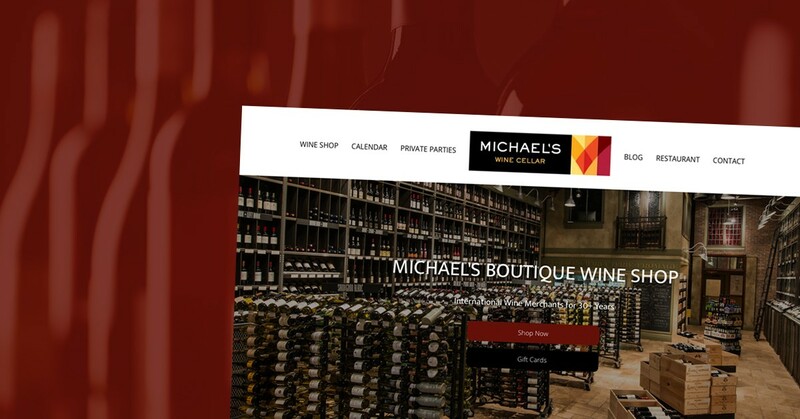 While scrolling through the home page, you’ll notice accessible “Shop Now” and “View All Events” buttons, along with the latest upcoming events and posts from Michael’s wine blog. To help with the distinction between sections, the color pallet and textures flow from rich, dark cranberry hues, to light and airy white spaces. Click through to the interior pages for easy access to wine shopping, private parties and events.